conorpmacneill – Sketches and Things…. a sneak peak at a page from a children’s book I’ve been developing. Author conorpmacneillPosted on September 1, 2017 September 1, 2017 Leave a comment on Benny the Whale! Tiago Hoisel is a Brazilian Illustrator and 3D artist who I’ve admired for some time. He recently posted these videos which demonstrate his creative process. I’m not sure how they were recorded in respect to the timeline, but regardless the techniques he uses are very interesting, in particular the one where he begins with a shaded sphere. I also stumbled upon some interesting funding options that allow Canadian and Brazilian artists to work together. I have included the link and some details below. A simple video showing a bit of one of my creative processes. It’s experimental, a kind of a brainstorm trying some different designs, so some of them may work, some not. I recently read an article by Joyce Bainbridge and Brenda Wolodko titled Canadian Picture Books, Shaping and Reflecting National Identity. This article immediately resonated with me in a number of different ways, first in its summary of the Canadian picture book industry and secondly, on a personal level what it means to be Canadian from an immigrant’s standpoint. My family and I moved to Newfoundland an eastern island province of Canada when I was a child, in 1981. I don’t believe it was the initial intention of my parents to make the move permanent for us, but I know that they liked Canada immediately. While leaving Ireland for North America was a journey that had been made by many countrymen in the prior 2 centuries, my family’s journey was perhaps different in the fact it was unclear if we would return, and in the early 80’s plane travel had become accessible, and for a number of years we returned every summer, and phone communication (although nothing like it is now) had become a relatively affordable option. This is a picture of me as a child in Newfoudland playing with icebergs, good times! I posted some details below of an Illustration I did for the practice component of the masters program. The intention of the work was to explore the myth of the Ogopogo lake monster reportedly found in western Canada. As mentioned in my previous post The Group of Seven – Canada’s most notable art movement? the Group of Seven hold a special place in Canada’s art heritage, and their simplified depictions of Canadian landscapes are undoubtedly some of the most recognized paintings within Canada’s borders. While the Group of Seven largely painted in eastern Canada I chose to explore the simplified juxtaposition of shapes, many of the Group of Seven artists used in their landscape depictions. My intention was to examine digital techniques that could be used for capturing a related visual style. While my style is usually pretty heavy on detail,I felt the process of simplifying the shapes down that were involved in the landscape elements ,was successful and one which could possibly be explored further in regards to children’s books intended for audiences under the age of four. The Group of Seven – Canada’s most notable art movement? 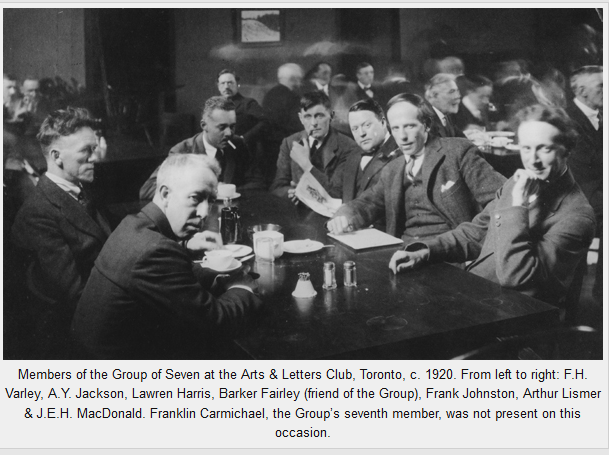 Author conorpmacneillPosted on December 28, 2015 Leave a comment on The Group of Seven – Canada’s most notable art movement? Throughout my research I have been battling with thoughts surrounding methodology. Is it wise for an artist to live within the wall of structure, or dangerous? In the early phases of my research I would have argued dangerous, in the fact that I felt it could act as a barrier to creativity. But now I’m not so sure, and recently have begun thinking that perhaps truly understanding the details of ones method and its relationship with the contemporary art scene may in fact be a key to differentiating ones work. While writing my post on Jon Klassen; the children’s book author, illustrator, and animator, I was fascinated to discover an interview where he credited animated sources as the primary inspiration for his books. I then began to wonder if I myself was more influenced by illustrations and still images or animation and multimedia? I also began to speculate if it made a difference, and I think it does. In animation you are forced to think of composition in a restricted manner, and line of action and poses must be considered from a different perspective. This got me thinking of the Canadian National film board (NFB), an institution respected around the world for moving the mediums of animation and film forward for many years. Here are a couple that have stood out to me over the years many with a bit of Canadian flare.